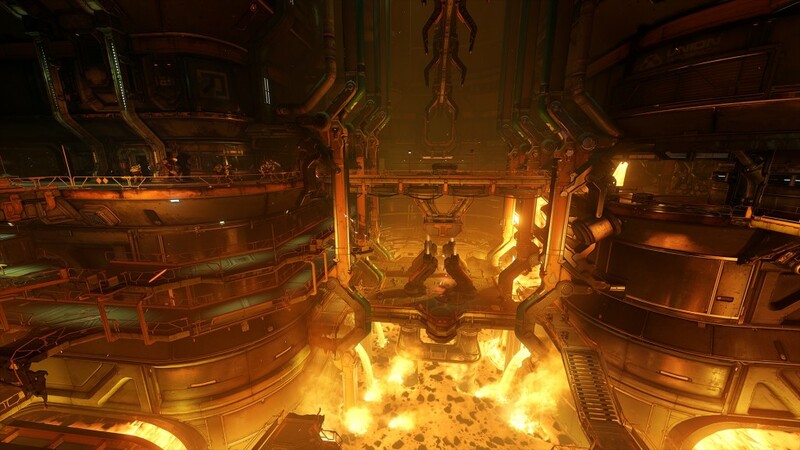 I recently was watching with my mentor the Foundry level from Doom released in 2016. I specifically remember this being one of my favorite levels. It had a lot of variety from a pure design standpoint as the player was able to go from corridor to arena style fairly quickly. The pacing was also broken up from leaving a combat zone, which was lit with blue to indicate a safe zone. Despite the area already being lit with orange the orange lighting also serves as a way indicate you entering a combat zone. There is backtracking within the level but this cannot be helped. They do give you a map to indicate where you going within the level. With all the major collectibles already shown. You do not have to get the collectibles. Enemies are are always easy to see and look interesting. The patterns are easy to read and the animation isn’t stale. The Ai’s movement pattern is also fairly easy to pick up on. Some enemies do go vertical when your are moving around in the combat arena such as the Imp and Hell Knight. Progression through the level is simple as you acquire keys in order to get through locked doors.